Michael Leach, DDS, is pleased to be able to offer beautiful smiles to his neighbors in Morristown and the surrounding communities. Dr. Leach studied at the University of Tennessee Knoxville, earning a Bachelor of Science degree. He then attended The University of Tennessee College of Dentistry, where he earned his dental degree in 1985. He has received extensive continuing education in cosmetic dentistry and facial esthetics, temporomandibular joint (TMJ) dysfunction, and the treatment of sleep apnea. He has taken thousands of hours of continuing education to better serve his patients. A member of the American Academy of Restorative Dentistry, Dr. Leach has presented a clinic at their annual meeting in Chicago. Dr. Leach loves volunteering and serves as a board member for First Love on Main. 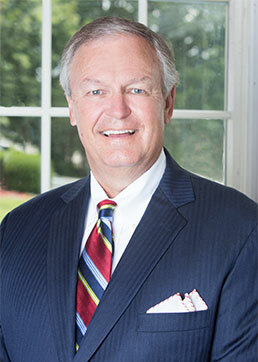 He has been past president of the school board for All Saints Day School, as well as past president and board member of The Country Club of Morristown. He and his wife Lyn love spending time with their son Drew, daughter-in-law Jordan, and daughter Rebecca and are members of First Methodist Church. Their family also includes four dogs, though that number changes depending on dogs Lyn finds in the community. In his spare time, Dr. Leach is a fly fisherman, duck hunter, and golfer. He and Lyn enjoy traveling and tailgating at University of Tennessee football games with friends and family. Dr. Leach is excited to meet you and discuss your dental needs. Call our office today at (423) 586-3432 to schedule the first step toward your healthiest smile.